This plant is or seem to be a Dyckia argentea affinis (affinis= related). I already shown it here but I have something quite interesting to show to you and let you see how fast and prolific a Dyckia can be. Dyckia reproduces in nature and in cultivation in some several ways, with seed , and throught sprouts are the most common ones. When throught seeds one may never be sure of the genetic material produced unless great care was taken during polination. Sprouts or lateral sprouting is a garanted and reliable method to be sure the offspring has the same genetic material as the parents. We could say cloning. This species still unknown abroad is a prodigious one. 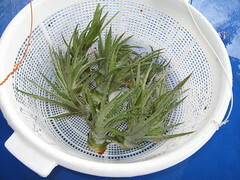 It is the fastest growing Dyckia I´ve seem up to now and the most sprouting one. Even so it is a splendid plant that enjoys a bit more umidity than those from the Brazilian Cerrado. So, it feels safe here in Santa Catarina where umidity is always at plenty. I gets much more silvery with the summer sun in fact it is one of the most silvery Dyckia plant of all. Guess how many? A dozen? No way! Two insisted to stay with the mother so they are there in maternal care. Look...fourteen plus the two left with their mother. Sixteen! The separated sprouts were cleaned and had their bases tiped in rooting hormone and then they will rest for a week on a hanging bascket to avoid roting when planting them all. Rooting with no roting! Now, believe me, the mother plant is one of the three sprouts I got from a collector just eleven months ago! Could it be faster? This was during a rainny october (spring) day so you can not see the plant silvery cover as it really is. I also changed the container shallower ones are more apropriated and plastic is an horror I avoid. 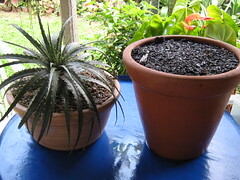 During summer days those black plastic pots boil the root system of the Dyckia. New roots are tender and extremely fragile and the temperature inside the substrate may be rocket to almost boiling.